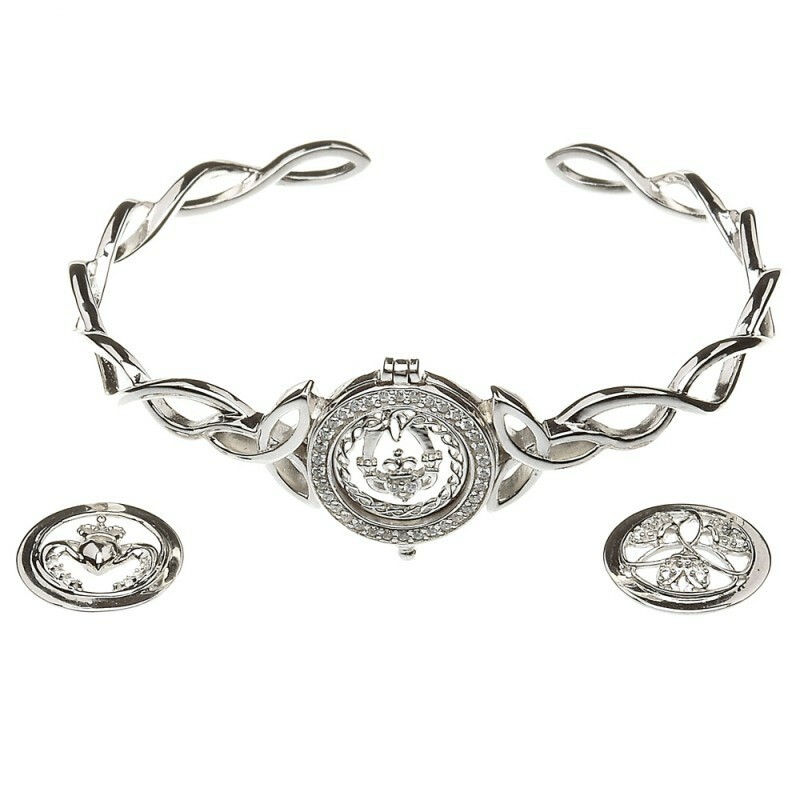 This Irish bangle bracelet comes with three interchangeable discs. One is is of the Trinity knot surrounded by tiny hearts, the second, a Claddagh heart and the third, a traditional Claddagh edged with rope work. Each elegant disc has been adorned with tiny cz stones. Combining two much loved symbols of Ireland and its heritage this Celtic disc Irish bangle bracelet is like three bracelets in one. The bangle itself is a Celtic twist which gently flows to create two Trinity knots, one each side of the centrepiece. The disc holder at the top of the bangle is encircled with tiny clear cz stones. A beautiful and dainty sterling silver cuff style Irish bangle bracelet for women of all ages. Handcrafted in Ireland, this Irish Celtic Bangle bracelet is A wonderful gift idea. Elegantly gift boxed for you to give with love. Stone Details: Clear cubic zirconia stones. Fits standard 7 1/2" wrist.